I thought to would be nice to make that easier and have people see (and demonstrate to bosses and clients) how damaging frontend SPOF (Single Point Of Failure) can be. A browser extension maybe. A Chrome extension, because I've never made one. The idea marinated undisturbed for a few days and last night all of a sudden I got to work. Now available at the Chrome web store. Well, yeah. What happens to your site when a 3rd party goes down? Does it still work? ...and so on and so on. This extension helps you check what happens with a click of button. It's a button with # on it. Click it. It turns red. The extension now listens to script requests made to one of the suspect domains. Now shift-reload the page. If a 3rd party script is found, it's redirected to the black hole and then a counter appears. Observe whether or not the page is usable when a third party is down. Enjoy and demo to your boss. Tell them: sites do go down, companies ban social networking sites, and btw what do you think will happen when you visit China and load our site? If you're looking for a page to try, go to mashable or business insider or, ironically, test the extension's page in Chrome web store. 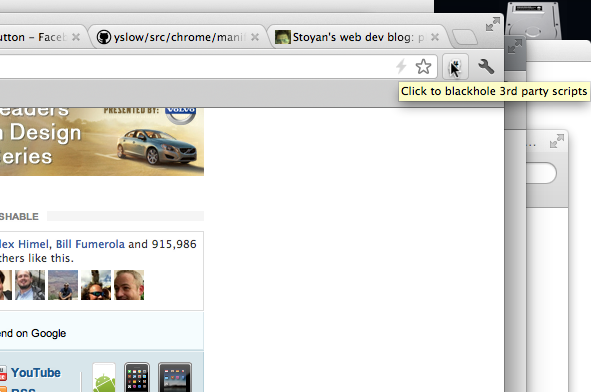 Turns out they include Google+'s button synchronously. Here come the LOLz. I blasted this extension out to Steve Souders and back he came with: doh, Pat Meenan also did a Chrome extension to do just this. Bwahaha. What? You snooze, you miss a whole new tool by Pat Meenan himself. Here's Pat's extension: SPOF-O-Matic. Try it, use it. It looks more thought out than mine definitely. And there's more code. Maybe Pat spend more time than a night on it. Or maybe he didn't, he's an amazing hacker and half! I mean, uh, webpagetest, hello! I'll definitely "borrow" his list of 3rd parties which has more entries than mine. Creating a Chrome extension was a first for me and was mostly frictionless. Well documented, plenty of samples (try to browse the samples in the repository, because downloading ZIP files is too many clicks). Debugging the extension in the same web inspector is a big plus! 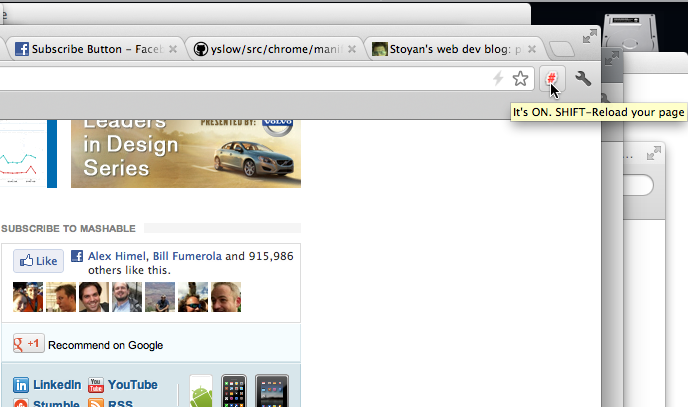 Overall I think it's easier to write a Chrome extension than a FF one. Although the last I checked, FF has improved a lot. Doplicating title, title, title is annoying. Sometimes it's title, sometimes text, or path or name. Method name appears short but in fact you have to remember one more thing - a property name in a config object. Sounds more like setTitleWithTitle(title) which is just as ridiculous (and popular in Obj-C it seems). Anyway. The web store asks you for 5 bucks to register and submit an extension. Credit card and all. I didn't like that. My extension was held for a review which doesn't always happen. The help section says 2-3 business days, but it turned out to be only hours for me. Got a nice email saying the extension is approved and also an explanation why it was held for review. Nice touch. The code is here: https://github.com/stoyan/3PO-fail. There's not a lot of it. A manifest file and an script that listens to specific URLs and request types in a onBeforeRequest event. Stripping away UI stuff here's all there is to it. There's no logic here because the API allows you to let the browser do request inspection and filtering for you. Here all you do is return an object with a redirectUrl property. And how do you setup your callback to be invoked? All you have to do is load third party scripts synchronously. See here the BFF function for an example. Yet, so many sites are not doing it. There's a need for people to understand this problem. Let's call it demand for advocacy. And now there's supply of 2 brand new tools that make it in-you-face obvious what the damaging effects are. I went over some of the pages that Steve has listed in his calendar blog post: Business Insider and O'Reilly. O'Reilly is better now and it uses my BFF script (nice, 'scuse me there's something in my eye). Business Insider is almost there. 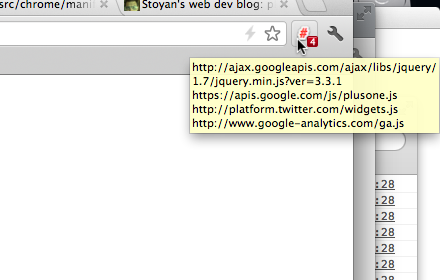 The social stuff is async now, but code.jquery.com is still a SPOF. Funny enough they have a blocking script tag pointing to twitter, but it has a class "post-load". So a script kicks in before this tag and replaces it with async loading. I wonder: why the trouble and not just go async to begin with?